Let’s take the health care debate and walk upstairs and back down to the cellar with it. Libertarians and social conservatives alike tend to like a forced savings, privatized, guaranteed issue and portable (sometimes subsidized for the poor) health savings account plan (covering most health care, even in old age, with special markets for catastrophic care), and, for that matter, retirement savings (eventually replacing Social Security and even conventional defined benefit pensions so championed by unions). They see things, up to this point, in terms of “personal responsibility”. Yes, they say, a lot of costly problems can be prevented by good health habits: avoiding smoking, drugs, high fats, sugars, STD’s, getting exercise. But such policies would result in people paying mostly for their own illnesses, including genetic ones they could not control (like probably juvenile diabetes). Social conservatives want to add another layer of responsibility, socialization and attachment, mostly through the nuclear family. Yes, individually healthful behaviors can reduce risk, but some risks, such as having and raising children and caring for the elderly (and maybe even defending the homeland), need to be shared personally by everyone. This gets sticky in a society that values personal competition and recognition so much. But essentially, this kind of thinking is grounded in three areas: religious teachings (as conveniently interpreted) designed to transcend self (the “It isn’t about you” line of Rick Warren), presumed blood and family loyalty (controlled by legitimate parents or family heads), and (putting it individual terms), risky-uncertainty-burden –sacrifice sharing, or “karma”. They want families to take care of their own disabled, as every family will have them. They de-emphasize public recognition for personal accomplishment or artistic expression in favor of layered personal attachments, with the limelight reserved for those who “earn” it sexually (through marriage and parenting). Some relatively closed societies, ranging from the Amish to the LDS Church (the Mormons), function with good stability and almost no crime this way. (But so did tribal systems in radical Islam, and that leads elsewhere.) Efficiency gives way to a place for everyone within a local social unit. It’s pretty easy to see, then, the attraction of European style “socialist” liberalism that, while statist, seems to take a lot of the most personal problems off people’s back and seems to allow more individual freedom without too much friction – except that, as we know, Europe slept too long, especially on integrating Islam into its culture (as in Bruce Bawer’s lesser known book). It’s easy to see the attraction of single payer health insurance, and even of subsidies for parents, without creating social frictions or trampling on LGBT people. Why can’t we have that system, some ask. It all comes down to what will be sustainable, and that’s a tough, disturbing question. Sustainability does imply generativity. I did have a disturbing, “Joseph dream” last night. As an elderly person, I was taking a multiple choice "open book" test, which was much harder than I thought I was stuck on a question half way through and was running out of time, being prompted by proctors to hurry up, even allowed to use my reference books. If I did not pass it, I was going to be removed from my apartment and be put in a group home. Down the street, teenagers were getting genetic and development tests. If they didn’t pass, they would be transformed into “grays”. We were on another planet, with plants slightly bluer and darker than our own (otherwise looking a lot like Earth, with similar levels of technology), and without money, but with a social system based on “karma” – and sustained perfection. There was no faith, no grace. The end was coming, as a brown dwarf approached and the planet’s human-like inhabitants would have to go to Earth to find another home. By now, I realized I was watching a movie, and it “was only a movie” or “only a dream” (and getting weird). Perfection is never sustainable. Wikipedia link for NASA p.d. 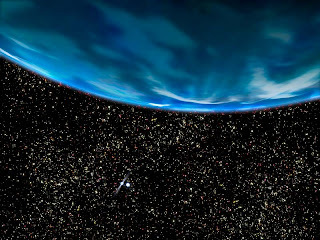 image of a pulsar planet.